Hello all! I am happy to announce that the Gryffindor scarf is done and you will all see a FO post soon. I still need to finish the last wristlet but for all intents and purposes I am done. I have ends to weave in and fringe to add but the bulk of the work is done. Life is settling down though my class is still not straightened out. I have a feeling I may have to take a half day of work and track down my professor. Seriously, how hard is it to set up a weekly call? I am super excited because I bought the fifth season of The Big Bang Theory! 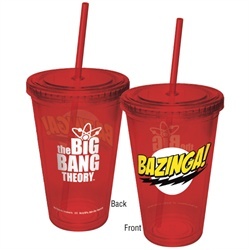 Target also had a cool cup that had the Big Bang Theory Logo and Bazinga! so of course I have to have it. What is more awesome is that I named my Fantasy Football Team Bazinga! How awesome is this cup! 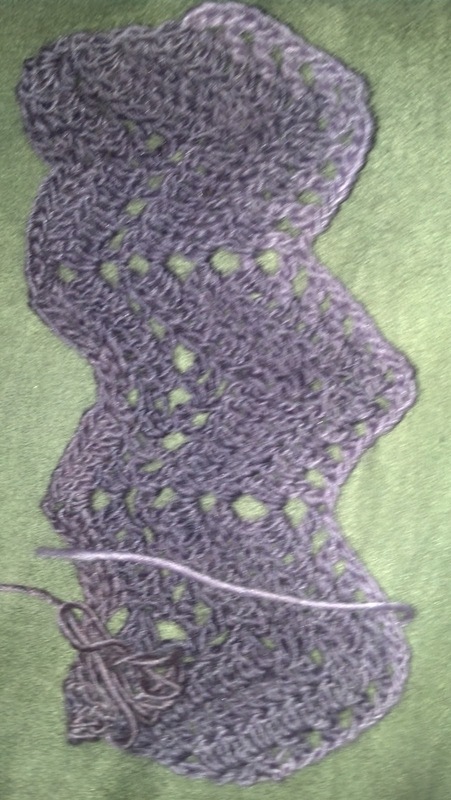 Anyway, aside from getting the scarf done, I started a new project and restarted an old one this week. So here are the updates. I finally picked this up again. I kept looking at it forlornly as I worked on other things but it is back with prominence in my knitting bag. 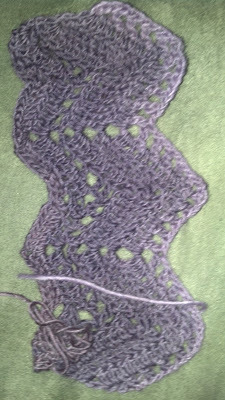 I think doing other lacey things have made me realize how easy this pattern has become. I have done 4 repeats of the pattern and it's amazing how fast you can whip through it when it's only about 35 stitches wide. I saw this pattern on Knit Picks this spring and fell in love with the color and the pattern. 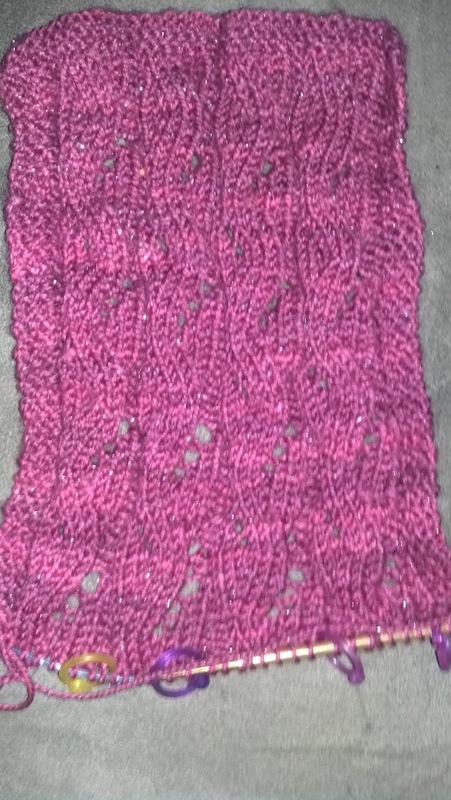 The yarn is variegated from purple to coral pink. I needed a bit of help getting started but the progress for an evening's work is shown below. I did make a boo boo and have to rip back a bit but it's okay. I would rather make this right than wing it. Well there you have it. I hope to get more work done on these this week and maybe start the foundation row of the Sweet Azalea Shawl I am working on as well. So what colors are you kicking off fall with? What are you starting or working on? Both your new WIPs looks fantastic! I hope the booboo is an easy fix! Thanks! 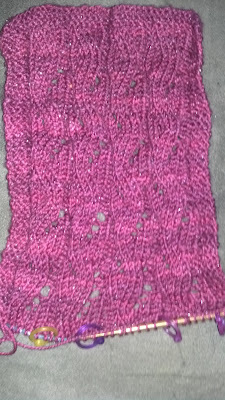 Yeah the boo boo is pretty easy i just counted wrong but if I don't fix it the whole scarf will be off. Thanks! I am so excited about the cup. Looks like you are excited for Fall with all of those scarves, you are going to be super cosy with those gorgeous projects that's for sure! Beautiful work! Thanks! I hope these go faster than the hogwarts scarf.